For an organism to perceive coherent and unified objects, its visual system must bind color and shape features into integrated color-shape representations in memory. However, the origins of this ability have not yet been established. To examine whether newborns can build an integrated representation of the first object they see, I raised newly hatched chicks (Gallus gallus) in controlled-rearing chambers that contained a single virtual object. This object rotated continuously, revealing a different color and shape combination on each of its two faces. Chicks were able to build an integrated representation of this object. For example, they reliably distinguished an object defined by a purple circle and yellow triangle from an object defined by a purple triangle and yellow circle. 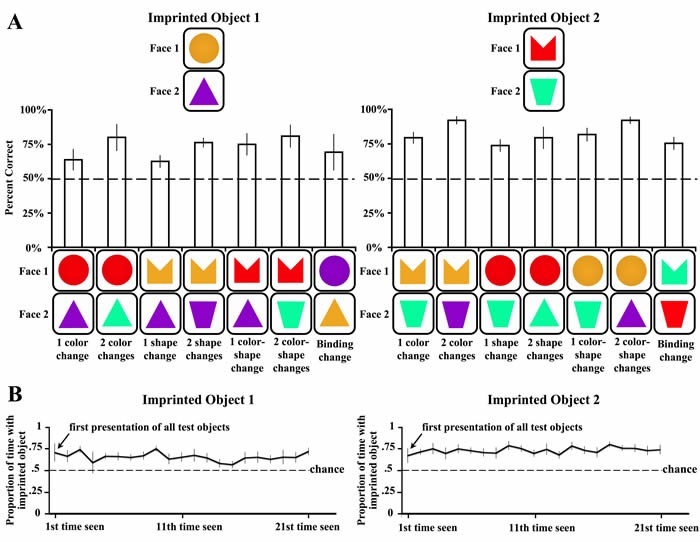 This result shows that newborns can begin binding color and shape features into integrated representations at the onset of their experience with visual objects. (A) Subjects’ mean performance across the conditions. Chance performance was 50%. Error bars denote standard error. (B) Change over time results. The graphs illustrate group mean performance, computed for the first, second, third, etc., presentation of the test stimuli. The y-axis indicates the proportion of time subjects spent with the imprinted object.